What Is An Investment Coach? You have decided that the time has come to take control of your savings and build a meaningful pot of money that is going to allow you to meet your long term financial needs. Like many people, you’ve embarked on your investing journey by either working with a financial advisor who has provided you guidance and information for planning for various life milestones or gone out on your own as a Do-It-Yourself Investors (DIY) and made these important decisions on your own. You found out that your advisor has been providing recommendations on a variety of financial products that may or may not be appropriate for you. They may have been too costly or did not perform well. You have invested on your own and have struggled with figuring out what stocks or ETF’s will help you grow your portfolio meaningfully. You bought some stocks and ETF’s and they haven’t performed well. You bought a few books, surfed the Internet, maybe took some courses, but you find the terminology and concepts confusing. You’re overwhelmed. You feel like you are stuck and your financial goals are out of reach. Wouldn’t it be great if you can work with someone with over 20 years of investing experience, who doesn’t sell you financial products nor is affiliated with a financial company and is more interested in helping you build the skills to become a more successful investor? My name is Aman Raina and I’m an Investment Coach and founder of Sage Investors. As an Investment Coach I help people who are striving to become financially independent but feel intimidated and frustrated by the investing process. They either don't know where to start or they haven't been making any progress with their portfolios. I teach and engage with people on how to make more educated and ultimately more successful investing decisions so that they can achieve some level of financial security and achieve it with confidence. As an investment coach I help people develop these three critical investment competencies. Successful investors have a baseline level of financial literacy. They understand the mechanics of evaluating, buying and selling stocks and ETF’s. They also understand the behavioural aspects of investing. They are very aware of the various emotional biases that can cloud their decision making. I need to be clear here. I am not talking about having an Ivy League education or some upper echelon form of financial training like an MBA, or pHD or CFA. You don’t need that. You do need to have a fundamental understanding of principles of how stocks work, how stocks behave and how to analyze and evaluate them. An Investment Coach, I will increase your financial literacy of stocks and ETF’s. People have a hard time with investing because they simply just don’t do it enough. At the most, people are actively looking at how their money is working when they receive quarterly statements and even then they have a hard time understanding if they are going in the right direction. We don’t commit the time to learn and practice investing. If we’re not engaged in the investing process, we will not receive meaningful feedback (which is ironic because technology gives us real-time feedback on the progress of our portfolios) and we will be less likely to improve our development. 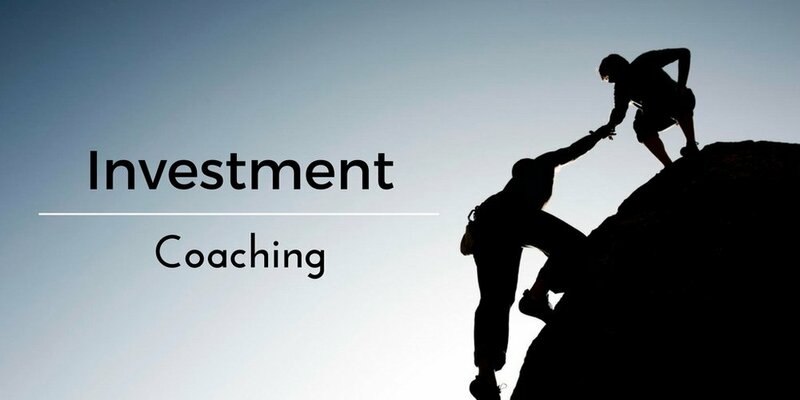 As an Investment Coach, I will engage with you and practice right with you in real-time to make sure you have a firm grasp of the core principles of investing and making sure you can apply those principles in real-time to make investment decisions successfully. When we increase our education and literacy level and when we start practicing and engaging in the process of investing, another competency will develop which is empowerment. The more we engage practice making decisions in buying and selling investments, the more experience we will get and that leads to confidence. Confidence does not mean chest-thumping and bragging. Confidence implies you develop a comfort level for the process and a process that works for you. When you make decisions, you don’t hesitate. As Investment Coach I will support you and empower you to increase your chances of making successful investment decisions. As an Investment Coach, I place a lot of emphasis on disciplined decision making through education, engagement and empowerment. Your path to financial success will be unique to you, and the obstacles you must overcome will be yours alone to face. As an Investment Coach, I will not give you the answer but I will work with you to help you explore the various options that will allow you to make the best investment decision for you. I consider myself to be more of an educator and mentor and not a sales person. As an Investment Coach I am compensated based on the time I spend with you to help you make better investment decisions...on your own! Investment advisors wants to sell you lemonade; whereas, investment coaching teaches, mentors and supports you to learn how to grow your own lemon trees on your own, so that you can drink all the lemonade you want for the rest of your life. Interested in learning more click below for more information on my in-person and online investing courses as well as my introductory coaching program. Email me below and I’d be happy to answer any questions you may have about my coaching services as well as the courses I teach. Thanks for your query. I would be happy to answer your questions and try to fill in some blanks. I will respond shortly.